It has been a year of firsts for the commercial drone delivery concept. In February, Alibaba’s online marketplace, Taobao, partnered up with YTO Express to run a real world test in Beijing, Guangzhou and Shanghai, allowing 450 people (on a first-come-first-served basis) to order ginger tea and receive it via UAV in less than an hour. In June, Fastway Couriers teamed up with Flirtey to successfully carry out drone parcel deliveries in New Zealand by transporting automobile parts along a 1.9 km (1.2 mile) route in less than 5 minutes, compared to 20 minutes by traditional courier. If the flight proves successful, this will definitely be the turning point for commercial package delivery drone systems in the United States. With US regulations for commercial drones likely be finalized and in place within a year, a positive demonstration by Flirtey will certainly influence the FAA’s present stance which currently only allows for low-altitude flights of small drones within the visual line of sight of ground-based pilots. A successful flight could also help allay people’s resistance to widespread deployment which, as naysayers like to point out, could lead to potentially crowded skies filled with thousands of delivery drones buzzing around with small packages and blocking out the sky. Dedicated “air lanes” and air traffic control systems such as the cellular tower based, “geo-fencing” system proposed by NASA and Verizon will be key to avoiding such a bleak dystopian future outlook. Furthermore, as seen with the public’s reaction to the fake video of a drone colliding with a Southwest Airlines airplane and shearing off the tip of its winglet, further development and deployment of sense-and-avoid sonar technology such as the eBumper System for the DJI Phantom or the ultrasonic sensor/stereo camera visual positioning guidance system from DJI will need to be a requirement for all drones. All in all, a lot is riding on this historic July 17 drone flight. 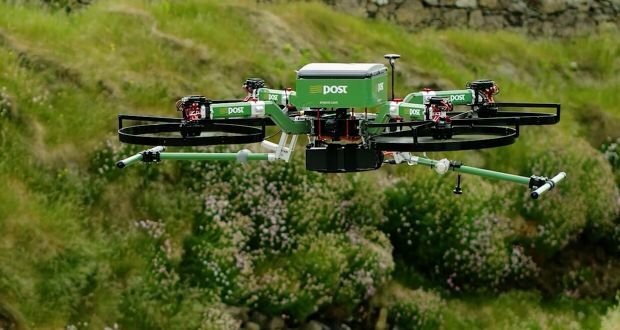 How rapidly drones are embraced for package delivery purposes, and whether the US is ready for such systems, might just depend on the outcome of the Flirtey flight. However, given Flirtey’s excellent track record, the future of the cargo drone delivery concept is certainly looking bright. What do you think about the future of package delivery drones? Comment below! I love reading about the current developments in Drone technology. As a Toolamker by trade and designer of things for fun, I can recognize the evolution of and production challenges faced by the makers of such things. Unfortunately, this also leads to frustration due to speed at which it is happening and the fact that I work with the equipment required to design and manufacture production quantities of the little miracles everyday. From what I can tell, we are at a point in history where there are only a few hurdles left, before the Revolution can begin. If We are Body, the automotive industry the Life Blood and computers the Central Nervous System. Then the Internet must be the Axons, mobile devices are the Sensory neurons and Drones, ironically, must be the Motor neurons. Without the last of these things, nothing much gets done.